The league on Wednesday dealt with the idea of protest in a dimwitted way that spits in the face of the idea of free speech. The new rule on the national anthem and kneeling is NO. If team personnel are on the field for the national anthem, they must stand or the club will be fined and the commissioner will deal with you later. But — and there is always a but when idiots are making policy — players and coaches are allowed to stay in the locker room during the anthem. This has all the optics of a mud-smeared camera lens. Whether protests during the anthem should be allowed, or whether the anthem belongs in a place of business such as the NFL, are different questions. There is also a dig into the concept of free speech, which is constitutionally protected but misunderstood. The First Amendment as it stands (for you strict constitutionalists) deals with the government and its abrogation of free speech and assembly. The government can’t tell players not to kneel, but the league can. And the NFL, as a business regulating its product and controlling the behavior of its employees, has that right. Can’t malign the perception of the product, and make no mistake, the NFL is a product, as carefully marketed as a mouthwash or detergent. The league cares about optics, which makes this ruling even more dimwitted. The NFL is banning free speech and silent protest. How stupid do you have to be to think that makes sense in this day and age? When Colin Kaepernick first kneeled, there was outrage. As other players and coaches knelt, the outrage grew. Then comments by President Donald Trump changed the tone of the debate to patriotism, rather than violence and silent protest against that violence. Was the outrage that players were kneeling, or the reason they were kneeling? If the players knelt because of, say, concern over school shootings, what then? There is an elephant in the room. Players knelt because they felt injustice was being done. They wonder if, should a traffic stop or other police interaction go awry, will they or a teammate be the next person in the headlines just because of the color of their skin. It’s a valid concern, but the workers in that fantasyland of concussions and damaged limbs aren’t allowed to protest where their message will be seen. Again, the owners have the right to run their business as they see fit, but come on. Do the billionaires care? Should they? As Cowboys owner Jerry Jones knelt with his players, was he thinking about how he and the other owners could deal with it? Maybe. This ruling makes it appear the league’s sole concerns are not losing paying customers and viewers or being the subject of late-night presidential tweets. Translation: The optics were really bad because some of the field hands got unruly. We will tell you what and how we think about stuff. What next, aside from a tweet from Trump hailing the NFL for its wise and august management? Remains to be seen. The revised code, as it stands, places a lot of pressure on clubs. If you are on the field, “you must respect the flag and the anthem.” Clubs whose personnel don’t will be fined. Some suggest there is nuance in the ruling, which says clubs can develop their own rules, but those rules must take into consideration the base of the structure, which is that if you are out there for the anthem, you will stand. It adds that the commissioner will deal with personnel who don’t comply. So clubs can make any rules they like, as long as they hew to the main idea, which is no kneeling. Sport has long been a forum for protest, from a Black Power salute during an Olympic medal ceremony to a nation deciding to keep its athletes home from the Olympics. Sport will continue to be a forum for protest. That a league would rule against that idea of free speech, even as it has the right to control how it runs its product, creates appalling optics. The league should be ashamed of itself. It isn’t and won’t be, but it should be. 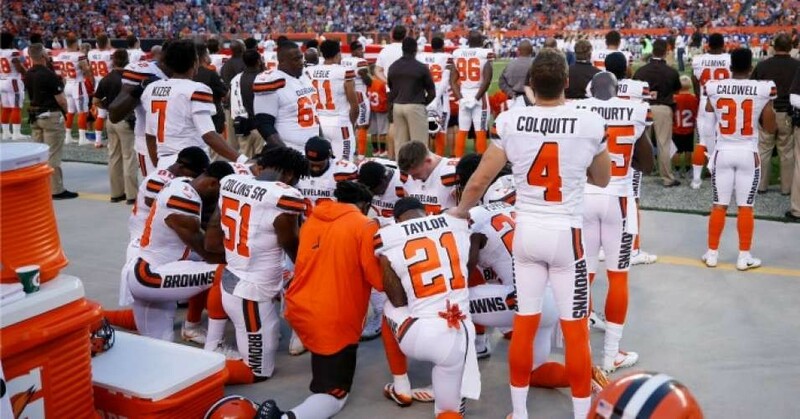 A group of Cleveland Browns players kneel, supported by other teammates who remained standing, during the national anthem ahead of a pre-season game against the New York Giants last August. National Football League (NFL) team owners were widely rebuked Wednesday for a new policy to penalize professional football teams whose players exercise their right to protest after athletes across the league locked arms, raised fists, or knelt during the national anthem the past two seasons to support a movement against racial injustice started by former San Francisco 49ers quarterback Colin Kaepernick. "If NFL owners actually knew what they were doing, they wouldn’t be having these Hamlet-esque meetings about how to clamp down on protest and would instead merely assert the basic truth: that players hold the right to protest, and fans should respect that right." "A club will be fined by the league if its personnel are on the field and do not stand and show respect for the flag and the anthem," according to policy statement released by the NFL on Wednesday. Commissioner Roger Goodell added that "personnel who choose not to stand for the anthem may stay in the locker room until after the anthem has been performed." No NFL owners have come out in opposition to the move, but 49ers owner Jed York reportedly abstained from voting for the new policy, which also allows individual teams to craft additional rules, and was strongly condemned by football fans and civil libertarians alike. The policy announcement came after Sports Illustrated reported that at a private meeting on Tuesday, owners who oppose the player protests proposed issuing 15-yard penalties against teams whose players kneel. Critics called that plan "utterly absurd," "industrial-strength stupid," and "PATHETIC." The Nation's sports editor, Dave Zirin, called it "among the worst ideas in the history of the National Football League," writing Wednesday that "one can only imagine an official saying, 'Exercising of constitutional rights. On the kicking team. 15 yard penalty. First down.'" In addition to a First Amendment right to peacefullly protest, as Zirin explained, "NFL players have had the space to protest during the anthem not out of the noblesse obligeof ownership but because it is enshrined in the collective bargaining agreement with the union." George Atallah of the league's players association, NFLPA, had said on Twitter that the labor group was not a part of the Tuesday discussion, and after the official announcement on Wednesday, the NFLPA issued a statement reiterating that "the NFL chose to not consult the union in the development of this new 'policy.'" In its statement, the NFPLA also praised NFL players for showing "their patriotism through...protests to raise awareness about the issues they care about," and vowed to "review the new 'policy' and challenge any aspect of it that is inconsistent with the collective bargaining agreement." "The idea that some owners would even propose this without speaking to the union is a sign of how drastically out of touch this group of aged billionaires are from the players in their league," Zirin concluded. "If NFL owners actually knew what they were doing, they wouldn't be having these Hamlet-esque meetings about how to clamp down on protest and would instead merely assert the basic truth: that players hold the right to protest, and fans should respect that right." This post has been updated to reflect that the 49ers owner abstained from voting for the policy, according to ESPN, and to include comments from the ACLU.